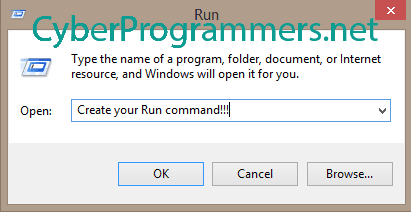 If you are a Windows and I hope you are familiar with Run, which allows you to access some programs or paths just with one line command. Have you ever think about to create your own Run command. Now we gonna learn how to create your own Run commands. 1) Right click on Desktop, choose New and from list select Shortcut. 2) Now from opened window press on the Browse button and select the file which you want to open. Then press the Next button. 3) And now you need to enter command name in the text box. For example, if you want to open Skype just by typing "Skype" command, then enter "Skype" in the text box. But make sure to do not use system reserved keyword. Simply press the Finish button. 4) Move that shortcut file from desktop to the "C:/Windows" directory. 5) Open Run box ( Use Win+R keyboard combination ) and enter the specified command you have created. You should get your results.